These individual Pavlovas are an elegant way to finish a meal. Pavlova is a dessert made of light meringue topped with whipped cream and fresh fruit. I love make-ahead desserts like this; you can have all the components prepped ahead of time and then assemble right before serving. 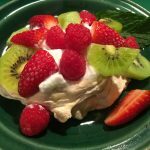 Meringue is basically whipped egg whites with sugar, so it is low in calories and makes the perfect base for the freshest, in-season fruit. To make it lighter, I have cut back on the sugar, added more fresh fruit, and made the meringues smaller. You can always skip the whipped cream and just serve the meringues with fruit and a simple berry sauce, or perhaps add a scoop of fruit sorbet. These individual Pavlovas are an elegant way to finish a meal. In a stand mixer, beat room temperature egg whites until soft peaks form. Add 3/4 cup sugar, 1/4 cup at a time, beating well between sugar additions, until all sugar is incorporated and egg whites are smooth and glossy. This takes about 4 minutes. With a rubber spatula carefully fold lemon, vanilla, cornstarch and pinch salt into egg white mixture folding until well combined. Prepare a baking sheet lined with parchment or non-stick baking mat. Shape the Pavlovas using a pastry bag, or just spoon the egg white mixture into rounds, making an indentation in the middle of each one. Bake in center of a 300 degree oven for 40 minutes. Turn oven off and let Pavlovas rest in oven for an additional 30 minutes. Remove pan with Pavlovas from oven and let cool at room temperature. Whip heavy cream adding 1 tablespoon sugar until soft peaks form. 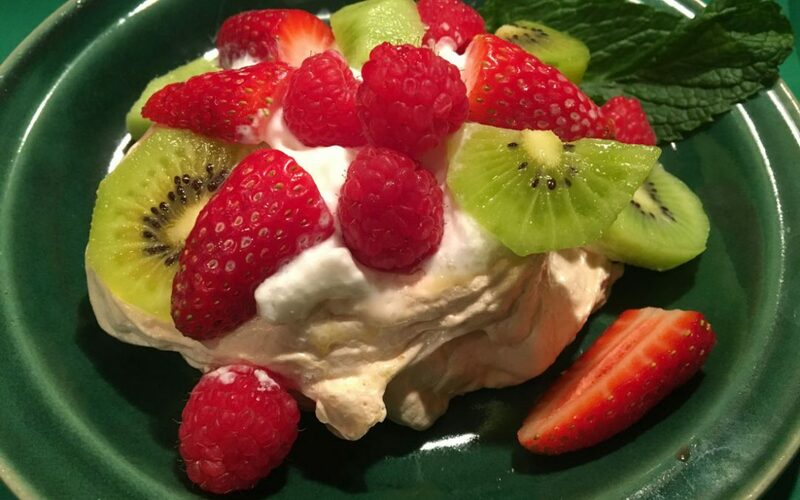 Assemble Pavlovas by placing 1 meringue on each plate, place a heaping spoonful of whipped cream in the center of each Pavlova and top with fresh fruit.